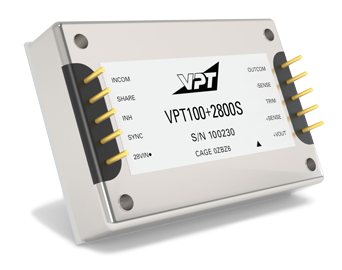 VPT100+2800S DC-DC Converter | VPT, Inc. This “plus” version of our VPT100-2800S Series delivers parallel operation of up to five units with current sharing, all in a single cost-effective package. Extremely efficient in a tiny quarter brick size, this series is based on proven, military heritage electrical designs and ideal for military vehicle, shipboard, weapons, commercial avionics or other hi-rel applications. To provide you with the most accurate data for the actual performance of this product once deployed, please note that the electrical performance data provided below is at Tcase = -55° C to 100° C, Vin= +28V +-5%, full load, unless otherwise specified. (2) Derate linearly to 0 at 110 deg. C.